AT RIGHT: Smile! (From left) Cr Liz Martin, Mayor Damien Ryan, MLA Alison Anderson, MHR Warren Snowdon, Cr Brendan Heenan, Cr Geoff Booth and Cr Steve Brown. BOTTOM: “Early works” at the landfill. You always know when an election is around the corner: Member for Lingiari Warren Snowdon is doing what he does best, namely spending public money or, in TV news footage, standing close to someone else doing it. 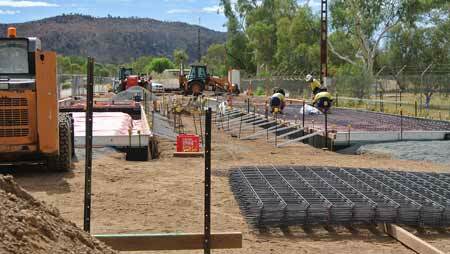 This would be in response to an application from the Western Desert Nganampa Walytja Palyantjaku Tjutaku Aboriginal Corporation Incorporated (WDNWPT) – Western Desert Dialysis for short, famous for The Purple House in Alice Springs, a home away from home for Western Desert dialysis patients. But as an apparent electioneering ploy Monday’s ‘event’ at the Alice Springs rubbish dump – sorry, landfill – was bizarre. Mayor Damien Ryan summoned the media, some of whom dutifully turned up, as did several councillors. What was this function all about, some of us asked ourselves. It couldn’t be the announcement of a regional rubbish dump with a transfer station and a recycling centre because that announcement was been made in July last year. 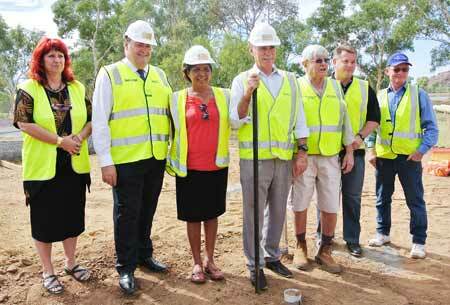 It couldn’t be a sod turning because no sod was being turned. It couldn’t be the official opening of the facility because work on it has just started. So was it just an opportunity, created by the Town Council, for Mr Snowdon to tout, as he did last year, a Federal expenditure of $3.5m for the project? Of course not. What an outrage to even suggest it. It was, in fact, an “inspection of early works” as a council spokesperson told us. There wasn’t a great deal of inspecting, although we were told to come in closed shoes or we wouldn’t be admitted. The function was mainly an address by Mr Snowdon, flanked by Mayor Damien Ryan and NT Minister Alison Anderson (what an odd trio), and the finale was a group photo opportunity with Mr Snowdon in the middle. There is a niggling issue: the $3.5m from the Feds came from Regional Development Australia of which Mayor Ryan is the NT chairman. So the Federal taxpayer was kicking in a lot of money for a facility for the region, not just for the town, although it is very nice for the town to have some infrastructure money spent here. Last year we quoted the council’s Director of Technical Services, Greg Buxton, as saying this facility would put an end to the current situation where the only licensed landfill in the region is Alice Springs, and all other communities are dumping rubbish illegally. This year the story has changed, it seems. We asked Mayor Ryan if garbage from the bush would soon be trucked into Alice. It’s your landfill, we suggested. Will they be running trucks into Alice? So at this stage it is not clear whether garbage from the communities will be brought into Alice Springs? But if they said to you we’d like to take some garbage into your dump which, after all, is a regional dump, what would you say to them? Perhaps the occasion for the next media doorstop should be when it’s sorted out what exactly the taxpayers will be getting for their $4.75m, including $775,000 from the NT Government and $475,000 from the Town Council.